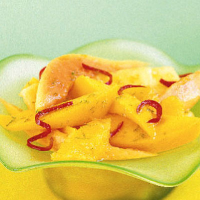 Peppery heat, soothing aromatics, succulent sweetness and glorious colour add up to an exotic fruit salad that has all the right elements for New Year cheer. To make the syrup, place the tea leaves in a teapot or heatproof jug and pour over 300ml boiling water. Allow it to steep for 3 minutes, then strain into a small saucepan. Add the chilli and sugar and place over a low heat until dissolved; do not stir. Turn up the heat and boil for 10 minutes until syrupy. Remove from the heat and add the lime zest. Put the fruit in a bowl. Drizzle with the syrup and allow to cool. Chill in the fridge for at least 30 minutes or overnight. Fresh jasmine blossoms can be used to scent any tea, but given that red chilli lends this sweet salad unusual fire-power, a calming green is best here.